Shortly after the 74,000 coins, as well as gold and silver jewellery, were unearthed by Island metal detectorists Reg Mead and Richard Miles in June 2012, press reports put their total value at around £10 million. However, that figure has been downgraded by the UK Treasure Valuation Committee, a body attached to the Department for Culture, Media and Sport based in London, which offers expert advice to the government on items of declared treasure that museums might wish to acquire from the Crown. The hoard has been declared ‘treasure’ as defined by the Treasure Act 1996, which means it belongs to the Queen, although under the law, the finders are entitled to a reward. 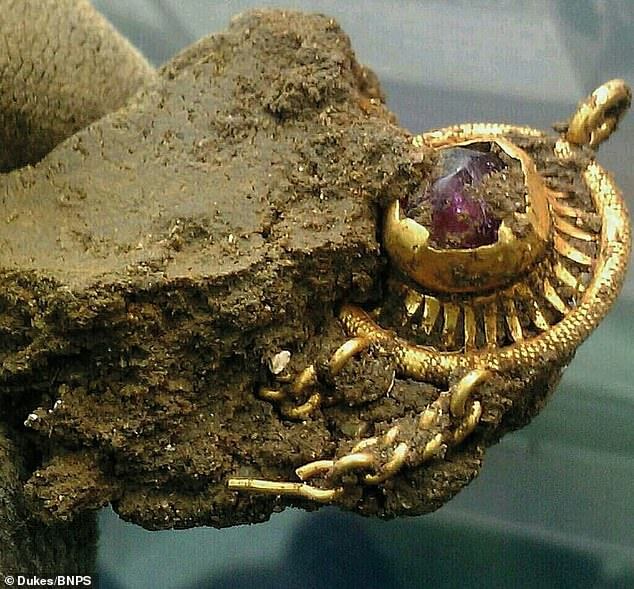 Mr Mead has said that the least valuable coins in the hoard, which dates from the first century BC, are likely to be worth £100 each, suggesting a valuation of at least £7.4 million, without taking into account the precious jewellery also found in it. However, there has been discussion over whether the price would come down because so many coins had been found, reducing their rarity. The valuation committee was originally asked to value the hoard in 2013 when it was still a large mass of corroded-together coins and other objects. They said that they would be happy to provide a new valuation once the hoard had been dismantled and it was possible to know exactly what it comprised of. That has now happened, but they say that their calculations will not be published until the matter of ownership has been settled.